I'd been in San Francisco for about a year, and my room in a charming lower Haight flat looked out over a pretty tree-lined street. I bought an Audubon guide to North American trees to figure out what they were. But no, *my* trees weren't in that book, because they were not native. If only, twenty years ago, I had Mike Sullivan's excellent guide to the trees of SF. In this book sixty four common trees are described and illustrated with color photos. In addition, twelve walking tours map out fun tree-spotting excursions in neighborhoods across the city. Sullivan clearly knows his trees and where to glimpse the most vigorous as well as historic specimens. He also supplies plenty of information in a lively and engaging style. Have you heard that a California buckeye on McAllister Street is the only tree in the city contractually protected from removal? What trees can you install in your backyard to lure some of our wild parrots? 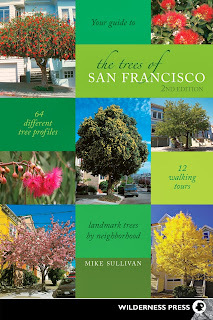 And if you're pondering a sidewalk tree for your neighborhood, Sullivan provides solid and sensible suggestions. This book is highly recommended. Disclosure: I received a review copy of this book from Wilderness Press.